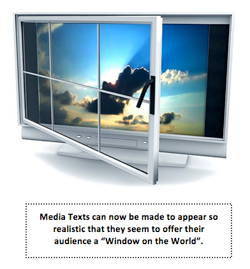 Media texts are often made to appear very realistic in appearance – so much so that they are often said to provide their audience with a ‘window on the world’. It’s a fact that we learn a great deal about the world simply through what we see, hear and read in the media. It’s important, therefore, that we can analyse just how the media does represent the world to its audiences. Is the way it does so wholly fair and objective, for example? It’s important that you, as a Media Studies student, can recognise just how the ‘world’ is being represented in media texts and why this is being done in a particular way – a way that often tries to manipulate the way the target audience thinks. Advertisements are, of course, the most obvious kind of media text that are designed to represent particular aspects of the world in ways that persuade their audience to want a particular lifestyle or product. With the realism that media companies can now create through the use of hi-tech equipment and resources such as computers, coupled with the amazing trust we have in the media itself, it’s not surprising that we often forget that media texts do not offer a genuine ‘window on the world’ but, instead, offer someone else’s idea of the world – a world-view that they want us to share because it means that we see the world the way they want us to. Even entirely fictional media texts are presented to their target audience in such a realistic manner that it is easy to forget that what is being shown is fiction rather than non-fiction. The popular TV programme, the ‘soap opera’ EastEnders, for example, is produced in a way that suggests an entirely realistic and believable storyline and images. TV programmes and films are technically referred to as moving image texts, by the way.